When I was a young speed demon, racing fast cars and motorcycles, we had a saying; “there is no substitute for cubic inches.” I have come to the conclusion that in the craft beer world, specifically when it comes to tap takeovers, there is no substitute for experience. Don’t get me wrong, I really enjoy each of our local craft breweries and I attempt to go to as many of their tap takeovers as possible; but the oldest production brewery in the South Bay is Strand Brewing Company and they will be celebrating their fifth anniversary in December. Last night we headed to Brewco in Manhattan Beach for a Firestone Walker tap takeover and Firestone Walker Regional Sales Manager Shane Kral pretty much pulled all the stops with this one, featuring brews ranging from their 2011 Parabola to their XVIII Anniversary Ale. This was a tap takeover that drew people from near and far as the tap list was something that you would have difficulty emulating without taking a trip to Firestone Walker’s Buellton or Paso Robles locations; even then it might prove difficult. In addition to Firestone’s core beers on tap, DBA, Union Jack, Pivo Pils and Velvet Merlin, they also offered 2011 Black Xantus, 2013 Double DBA, 2014 Agrestic, 2014 Velvet Merkin and the Firestone XVIII Anniversary Ale. For good measure there were bottles of 2011 Parabola and 2013 Sucaba also available. As if these were not enough, for dessert they offered Pazookis (a hot brownie cake) topped with Velvet Merlin Ice Cream crafted from Sweet Rose Creamery in Santa Monica. To say it was delicious would be like saying Union Jack is hoppy. Wednesday was day five of the 2014 LA Beer Week and in the South Bay we had a tap takeover by Firestone Walker at Simmzy’s in Manhattan Beach and another by Allagash Brewing Company at Naja’s Place in Redondo Beach. We started off at Simmzy’s where Shane Kral, Regional Sales Manager at Firestone Walker hosted the event. In addition to the Firestone Double DBA, Union Jack, XVII Anniversary, Pivo Pils and Bretta Weiss, he also brought along Jeffers Richardson, the original brewmaster for Firestone Walker and the current Barrelmeister and Director of the Firestone Walker Barrelworks in Buellton. It was interesting to talk with him a little about Firestone Walker and their planned location in Culver City. As of now, look for that location to open sometime in the middle of 2015. I have only visited Simmzy’s a few times, but I have always been impressed with their tap list and the food is pretty good too. We had a salad that was delicious but I admit I saw a coupe burgers come out of the kitchen that looked really good; I just do not know that my mouth would open wide enough to fit one in. Simmzy’s is located at 229 Manhattan Beach Boulevard in Manhattan Beach. Saturday evening I joined a few dozen others for the South Bay Progressive’s second “pub crawl” which included five South Bay venues that specialize in craft beer; each of whom showcased a different American craft brewery. The five venues and the breweries they featured were Brewco, Manhattan Beach featuring Smog City Brewing; The Brewery at Abigaile featuring Stone Brewing Company; Silvio’s Brazilian Barbecue featuring Modern Times Beer; Naja’s Place featuring The Bruery; and Select Beer Store who featured Great Divide Brewing Company. Transportation for the event was provided by LA Craft Beer Tours. We started our tour at Naja’s Place since it was the closest with the best parking options; the fact that they were showcasing The Bruery made the decision process a little easier. I have to admit, I was a little shocked when I saw the Naja’s tap list as it was emptier than I have ever seen. I was then reminded that Naja’s is having their 6th Annual IPA Festival this coming Wednesday so they are in the process of cleaning all their lines. 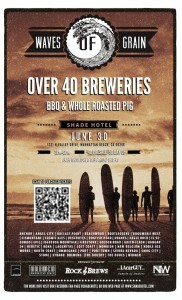 If you enjoy IPAs you will want to head to Naja’s Place for this week long event. My intent was to visit The Brewery at Abigaile next with a stop by Silvio’s on the way back but a scheduling conflict resulted in Silvio’s closing at 7:00 PM for a private party so we headed to Silvio’s first then walked up the street to Abigaile. After grabbing a beer, some food and photos we headed to Brewco in Manhattan Beach. As one might imagine, Saturday night in Manhattan Beach meant a pretty large crowd but the service was fast and the people were friendly. After enjoying a beer most of us got back on the bus and headed back to Naja’s Place which was now jumping with live music and an even more lively audience. 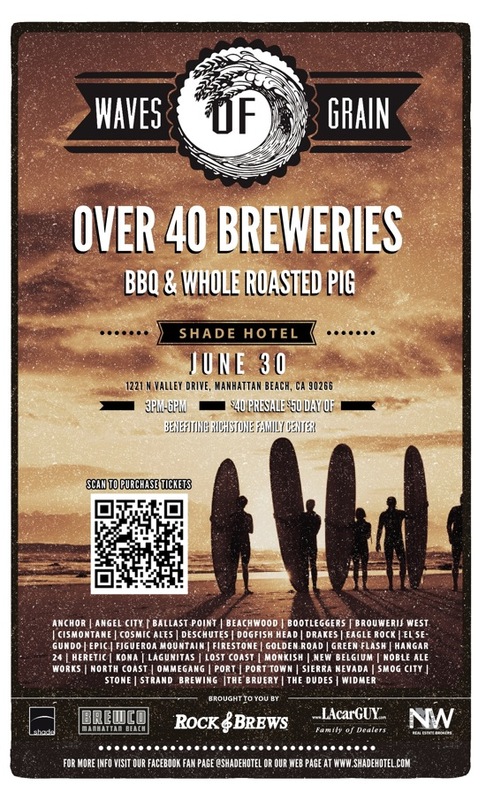 Sunday June 30 the Shade Hotel in Manhattan Beach, CA hosted the 2nd Annual Waves of Grain Beerfest benefiting the Richstone Family Center in Hawthorne. The Richstone Family Center is dedicated to preventing and treating child abuse. Co-sponsored by Brewco Manhattan Beach, Rock & Brews El Segundo, LA Car Guy and NW Real Estate Brokers approximately 400 people enjoyed food, music and close to 100 beers provided by more than 40 craft brewers. In addition to the ticket sales for the event, which sold out, there were raffles for dinners, massages, hockey and more. I think it is safe to say that the Richstone Family Center was very happy with the results of this fundraiser. Judging by all the smiles seen in the photos I am not the only one that had a great time and I look forward to attending next year’s event.